We've seen it endless times, especially in new subdivisions. All the topsoil removed for house foundations or removing trees leave a rising bank of dirt on either side of the driveway, or down one side of the yard. Or perhaps the property was once a ravine or built on a slope, but the plants that held the bank up are long gone. Without expensive terracing using timbers and stone walls, the bared earth will erode. Setting flagstones at an angle starting along the base of such a slope, and then working up in rows can be effective - especially if inter-planted with plants and shrubs with strong fibrous root systems. 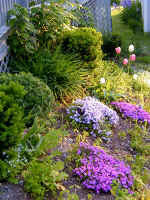 Creeping junipers are a good choice, as are honeysuckles (leave them to ramble), perennial sweet peas (lathyrus latifolius), daylilies, and bittersweet (Celastrus scandens). The last one is pretty rampant, but may be just the ticket for a tall bank. Common daylilies will handle gradual slopes - and this is the wild daylily (hemerocallis fulva) not one of the popular, but puny in comparison, cultivars. Other good plants for gradual slopes are ferns, ivies (hedera) for shadier banks, staghorn sumac, and many ornamental grasses. The usually odious bishop's weed (aegopodium) is good too. Crown Vetch ( coronilla) is another rampant grower that may do the trick - and blooms for a long period in the summer too. 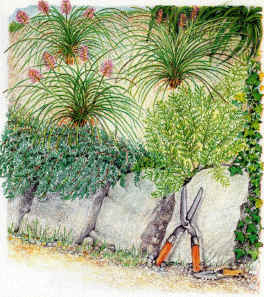 Lilyturf (ophiopogon), a clump forming ornamental grass is also suitable. We are striving for soil retention here, so blooms are a nice-to-have. The plants for this example are meant for sunny or mostly sunny locations. It's rather difficult to specify the many ways this type of garden could be adapted to a specific situation. Depending on the severity of the slope, you may or may not need to use the flagstone approach noted above. 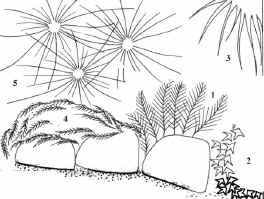 You may need a mix of a course of flagstone across the base, and fibrous rooted plants between them and above. If your bank is shady, many of the plants noted above won't work. Ivies, honeysuckle (the white flowered, semi-evergreen, Japanese types), and bishop's weed would be suitable, as would Virginia Creeper (parthenocissus quinquefolia). Lilyturf is not too fussy about the amount of sun it gets. If the slope was gradual, you might try a ground-hugging euonymus radicans, or the groundcover viburnum (viburnum plicatum tomentosum) that will root along the length of its spreading horizontal branches. Here's the planting diagram for this garden. Here's a color rendering of what this bank garden would look like.